When the buyer writes letter to the seller requesting him not to deliver the ordered goods, it is called letter of order cancellation. Generally, customer places orders for delivering some specific goods in his address. Having been received an order from customer; the seller takes step to deliver goods immediately. Because, delay in delivery can cause the customer to do business elsewhere. However, after placing the order, the customer may be unwilling to get the delivery. 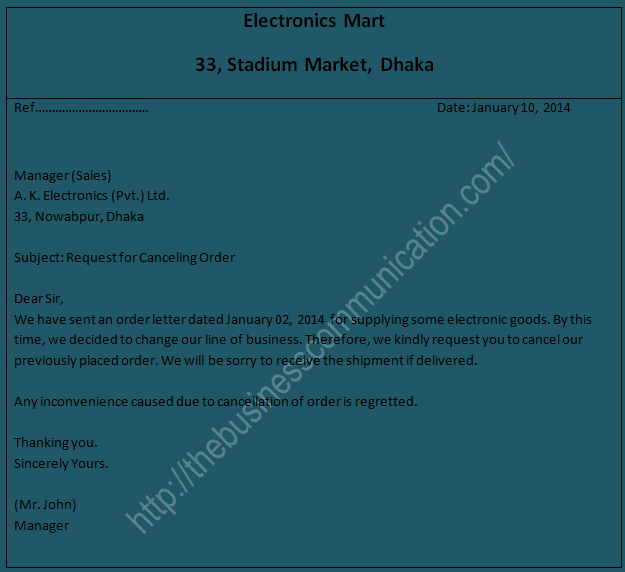 In this situation, the customer writes a letter to the seller canceling the previously placed order. This letter is known as letter of order canceling the previously placed order. This letter is known as letter of order cancellation. Assume that you have placed an order to A. K. Electronics (Pvt. ) Ltd. 33, Nowabpur, Dhaka, to supply some electronic goods. Write a letter canceling your order as you have decided not to do business in this line. Filed Under: Letter Writing Tagged With: Causes of order cancellation, Contents of order cancellation letter, Meaning of order cancellation letter, Specimen of order cancellation letter, What is order cancellation letter?